The labour rights group, China Labour Watch, (CLW) a New York non-profit organisation keen to promote transparency of supply chains and factory labour conditions in China hoped to publish a report alleging low pay, excessive overtime, crude verbal abuse and possible misuse of student labour at the Huajian Group factory in Ganzhou. Allegations of physical abuse of workers and the company forcing them to sign fake pay stubs with inflated salary numbers as well as threats to sack workers who did not complete questionnaires about working conditions with pre-approved answers, raised concerns. After workers claimed the company pressured people not to speak with outsiders about conditions at the factory. Three Chinese investigators went undercover at a factory to gather video, pictures and evidence of exploitation. In late May of this year, the three were detained by police. After being imprisoned for a month on charges of using secret cameras and listening devices. They were bailed from jail but may still face an uncertain future and the threat of a trial. 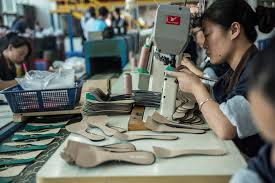 Some of the Huajian Group of the factories had previously produced Ivanka Trump shoes, among other brands, but denied all allegations of excessive overtime and low wages. The Huajian Group, have started to move their production to Ethiopia, where workers make around $100 a month, a fraction of what they pay in China. Before taking on an official role as adviser to her father, Ivanka Trump stepped back from day-to-day management of her brand, but has retained her ownership interest. She has not commented on the detentions or the reports of poor working conditions at one of her brand’s suppliers. The president of the Ivanka Trump brands company, confirmed their shoes had not been produced at the factory in question since March.